We’re heading into the dog days of summer, and what better way to cool down than with a chilly ice pop? But not any ice pop will do! Skip the options found in your local supermarket, which can be laden with artificial color and sugar. Instead, be creative and make your own! With summer in full swing and fresh produce widely available, you’ll create much healthier options than those found in the grocery store. While there are classic ice pop flavors we all enjoy–such as sweet fruits–be bold and try a fruit and veggie combo. Or, try adding citrus and/or herbs; they are uniquely qualified to add an extra layer of flavor. To make the pop “icier,” use water-based fruits, vegetables, juices, and herbs. Yogurt or milk-based products will add protein to the pop and create a creamier product. A handful of chia or flax seeds will contribute fiber and omega 3 fatty acids. 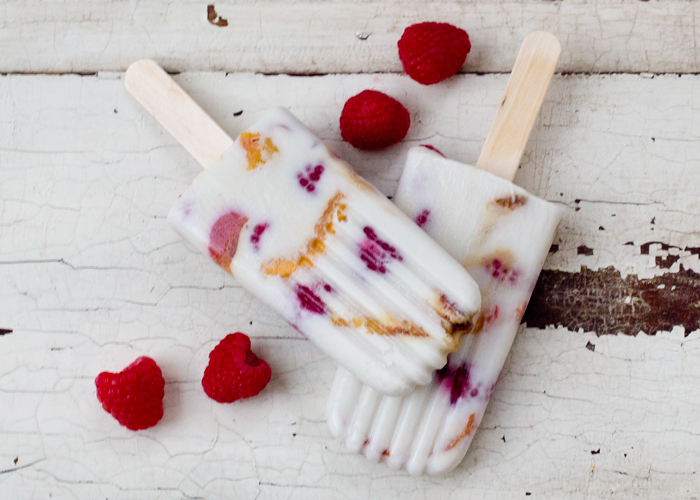 Basically, whatever you put in a smoothie will work in an ice pop. Make it a family affair and have your children help with the fun! No special equipment is required. If you don’t have ice pop molds, you can use ice cube trays or plastic cups and a wooden stick. Paper cups will also work; you just peel away the paper and enjoy! Fill the “mold” with your blended ice pop mixture. Cover with plastic wrap. Cut a small hole in the center of the plastic wrap and insert the wooden stick. Place in freezer for 6-8 hours or overnight. When ready to eat, submerge the bottom part of the cup or ice cube tray in warm water for a minute or two. Be careful not to allow water to reach the pop. The ice pop will slide right out once the bottom is softened. Place berries in a blender or food processor and blend until they are pureed. Add yogurt and mix well. Pour into molds and place in freezer overnight. Place all ingredients in blender or food processor and blend until mixture is pureed. Add unsweetened coconut. Pour into molds and freeze overnight. Stir all ingredients together until well-blended. Pour into molds and freeze overnight. Place all ingredients in blender or food processor. Blend until mixture is pureed. Pour into molds and freeze overnight. Submitted by: Jennifer Even, Extension Educator, EFNEP/FCS, Hamilton County. Source(s): Delicious Living, July, 2015; WebMD.com/diet retrieved August, 2015.